We decide on an even earlier start than before as we have not only a hot day predicted but we are aiming for a small albergue with only 4 beds and presume the camino rules of "no booking, and first come gets the beds" apply. We stop on route to investigate the Porto campsite as we intend to use it in 2 weeks time, but it appears to be closed. A problem that needs solving over the coming days. This is probably the most unpleasant day's walking so far, not only is it pavements and cobbles but there is little to relieve the monotony of the walk out of Porto. It also contained the worst road crossing so far experienced on the Caminos with the possible exception of the urban motorway outside Burgos. The minor road we were on, met a major road with central crash barriers (two with no space between) and very little space between consecutive vehicles on either carriageway. High speed hurdling skills would have been useful! Later frequent large lorries buzzed past on a road barely wide enough for two cars without any footpath. But all good (and bad) things must end and finally we arrive in Vilarinho after passing through several other places beginning with V with great disappointment. Tony has failed to torment the 5 german pilgrims on the road with us into a race and has accelerated past us all to see if he can check in to the pharmacia and get the keys to the albergue before towels/bed rolls are placed on the only 4 beds available in the part of the school no longer required for education. to lessons and after lunch in the village we doze in the shade of the playground wall. Or some of us do! Relaxed after a good lunch in town, Tim has a badly timed moment of altruism and shuts the albergue door on his way out, in an attempt to keep the temperature inside down. Yes, you guessed, the keys were still inside. "I knew it was a bad idea as soon as I did it". Faced with little sympathy from fellow peregrinos, his longed for siesta began with another trip into town to beg in sign language for spare keys - all the more urgent because our new Italian companion, occupant of the forth bunk, was last seen heading for the showers with minimal clothing! All is sorted though the system for the second set of keys must have been devised by a computer scientist (who else would place the second set of data on a distant site). A short time later the kids come out to play, so much for siesta. Betsy talks to them in portuguese they seem impressed by the walk we are doing. Tony thinks we should all have been CRB checked before being allowed check into the albergue. Then the bell goes, peace gradually descends again. We wake to the sound of wind rattling shutters, but unlike home this does not herald rain. It is still hot but the wind keeps it to a temperature bearable for walking. Today we have to walk into Porto, this will involve mostly road walking. First we pass around the monastery in Grijo and after a while on quiet suburban roads pick up the old medieval/roman road over a ridge through a eucalyptus forest. It is paved with some large rocks many of which are of igneous pegmatite according to Betsy. Betsy meanwhile is a little concerned by Tim's wish to collect a dead lizard seen on the pavement - does he already have a secret roadkill stash somewhere in his pack including previous victims seen such as 2 snakes, a bat, a vole, a mouse, some large beetles, the ubiquitous flat cats and dogs and a surprisingly large number of small birds? After that treat the route gradually deteriorated becoming more and more built up and seeming to last forever along crowded roads and pavements. Eventually we sight the Douro, still well below us, and cross on the bridge high above the little boats bringing port down to the shippers. At the far end is a bar, the beer is twice the price of the cheapest we have had on The Way. Just round the corner is the cathedral where we get a carimbo and sign the book. We wonder if it is sent to Santiago to cross reference with the arrival statistics in the cathedral office? The route descends steeply down narrow stepped streets and we stop for lunch. This is a city where even a small restaurant has an English translated menu, Tony and Tim have "Different Fish" and very good they are too, at least two types, with boiled potatoes and a sauce of onions and parsley coarsely chopped in olive oil with a little vinegar. Betsy got the chips with her pork as usual. The price was city prices! We leave content, and go down a bit and up a lot. The citizens of Porto must be a fit lot, just walking the streets is serious exercise. We find a room in the planned residencial (overcoming a minor panic when at first sight it seemed disused and roofless, shades of Malaga - but that's another story) and after showers crash to recover from pork and different fish, only noticing the large sign forbidding any washing of clothes when a line of slightly dripping items is already stretched across the room! St Joao da Madeira to Grigo. An even earlier start than yesterday, out and walking by 0620. 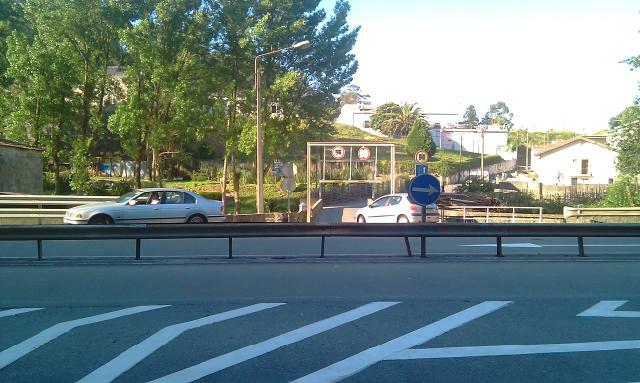 We pass the hat factory (now a museum) on the outskirts of St Joao da Madeira after 10 minutes. 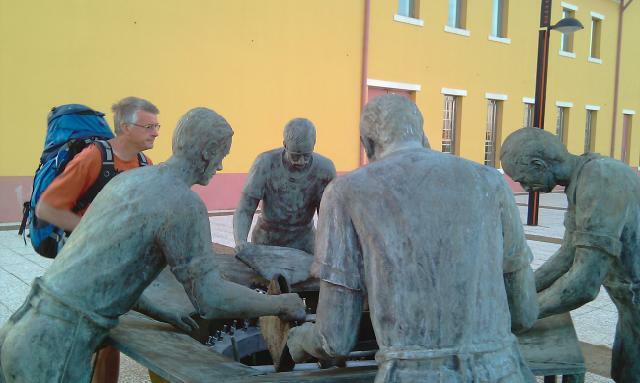 There is an interesting group statue around the back. Pressing on, the day unfolds with a mix of minor roads with tarmac and minor roads with cobbles and roman laid stone paving, in some places the 1700 year old road is in the better condition. Wandering along we talk with a spanish pilgrim on his way to Santiago and spot an elderly lady doing her washing at the lavadeira. When at about 1100 we reach Grijo, about 18km short of Porto, we consider our options - to push on in the increasing heat and maybe push Betsy's recovering shin too far, or to look for accommodation just off route. 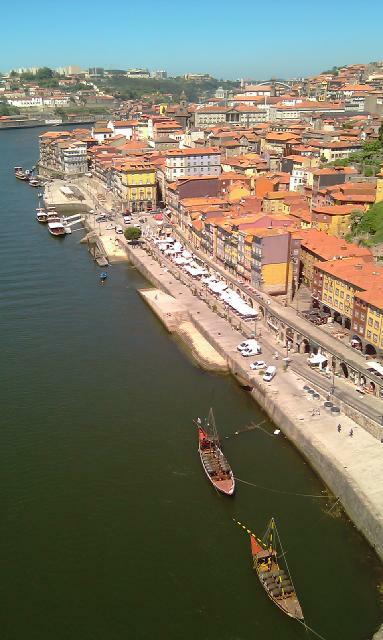 We choose the latter, the whole distance into Oporto would be 37km and we have two days in hand. We can just see the sea in the heat haze and the washing line outside in the garden of the residencial is an added attraction for rapid complete drying of our washing. Albergeria a Velha to St Joao ds Madeira. We are off a little earlier than previously owing to the increasing heat. By seven we are making our way out of Albergaria with its misleading arrow up the rail track. The way is via a small road - a bit busy but soon turns off into another eucalyptus forest. But reasonably well marked. 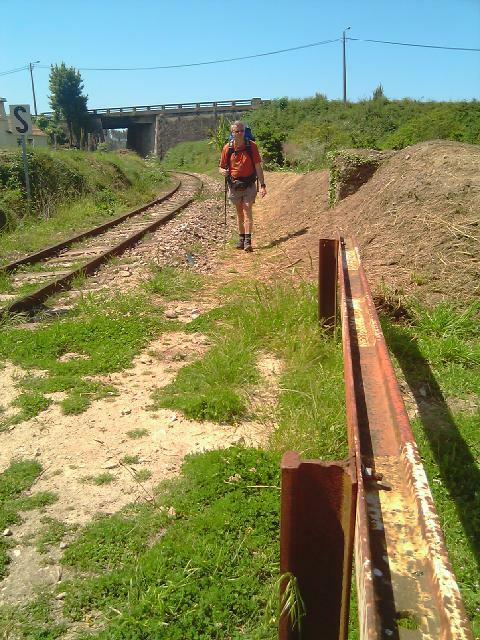 The route today involves multiple crossings of a hardly used (we hope) railway track, it weaves its way around the contours we cross finding the easy way, the caminho follows it for a short distance and rejoins it for a passage under a viaduct. There are many ladies around wielding heavy duty mattocks with enthusiasm in their gardens and smallholdings. Hay making is also on the rural agenda along with watering of vegetables using a weeled vat laboriously filled by one old lady at the roadside tap. We pass through Bemposta with an old part with some nice old buildings and after a few more up and downs including a crossing of a flood plain on a restored mediaeval (or roman) bridge and causeway reach Oliveira de Azemeis. This may or may not be our finish for the day, Tony"s GPS log suggests 330km (we think it was hot and went via the Azores) Tim's route is a mere 19km, but most importantly Betsy's shinometer says it's ok to continue. We have lunch in a cafe well frequented by locals and probably push up the average age of the clientele by at least 5 years. Continuing on The Way through the town we pass a roman milestone followed by the mojon - a present to the town from Galicia with one of the few tile scallop shells seen so far, with which we became very familiar 2 years ago. It is 290km to Santiago. Another hark back to Galicia is the appearance of horreos, the grain and food storage buildings on legs with overhangs to stop the rats getting in. It gets hotter, beer stops become more frequent, we cross the rail tracks several more times and, (somewhat worryingly) hear two trains passing. Whether these are figments of our overwrought imaginations will never be known. The ground seems to be going up and down more frequently. Eventually we reach St Joao da Madeira and find a modern metropolis and with a little difficulty Praca Louis Ribeiro with the residencial. A long day of about 29 genuine km or 400+ on Tony's GPS, and a doubtful 2000m of ascent/descent, but Betsy's shin seems mostly ok.
A quiet night at the Bombeiros, no other pilgrims or bombeiros disturb our rest on the dormitory at the back of their 200 seat auditorium we set off fairly early after a coffee in the cafe opposite, the house at the end of the bridge appears quiet as we pass, observations yesterday tending to confirm its status in the guide. We expect a short day today 19km. Betsy thanks to a short day yesterday has an improved shin. But at the first coffee stop Tony swaps packs and loads Betsy's huge pack with some of his own stuff. Thus lightened she seems to cope better. The route is mainly tarmac country roads and pleasant walking with a well restored medieval (or roman?) bridge over a small river almost under the modern roadbridge. However at one point we travel along tracks through a eucalyptus forest in which (although we successfully negotiated the two in which our guide came to grief) we have difficulty finding yellow arrows. We think we were led astray by a broken one, and then broke the cardinal rule, (when on a deteriorating track without signs turn round). After finding the motorway and seeing a bridge 250m away we then had about 200m of undergrowth and a stream to cross. This seemed preferable to two barbed wire fences , two crash barriers, a metre high concrete central reservation and two streams of high speed traffic. We get across and after about 4km we enter Albergaria a Velha, our destination. The route takes us over an old railway line and up the side of the town so we are almost out of town before realising we have missed the main square and our lodgings. We retrace our steps and with the help of two locals and Betsy's excellent portuguese we find it. It has a restaurant next door in a wine cellar - we have lunch, surrounded by barrels of wine, and washed down with very good vinho da casa, it is half price! We don"t ask why maybe because we are staying next door maybe because we are pilgrims. After a siesta (the weather is hotter now) we wander round and visit the local library to take advantage of free internet access on something easier to use than the phones. Betsy deletes many emails and discovers that the deaths of the bombeiros in Agueda in 1986 were due to a high wind during a forest fire trapping them on a track. We set off together from the piglet centre of the universe, we ate some last night it was worth it but not a cheap stop. We wander at first down country lanes through small villages with houses that are better tended and few derelict. In some villages the churches not only had a fine black cockerel as a weather vane but the same nauseatingly repetitive chime through loud speakers replacing the traditional bells that ring the hours. But in other places there is an obvious air of decay and decline. Alas after 12km the shins of Betsy (no not the sins) became bad enough that she agrees to find alternative transport. There being no donkey or sedan chair available she settles for a taxi driver summoned from his Sunday rest by the lady in the bar in which we stopped for coffee. The two remaining continued down similar paths to days past with increasing evidence that we are on The Way, scallop shells and road names including Santiago. This has really been less evident before and the route as befits the way to the major portuguese pilgrimage of Fatima has been mainly in the reverse direction, now St James is in the ascendancy and instead of fellow pilgrims trying to turn us round we are wished well by locals who know where we are heading. Shortly after starting this morning we met a serious spanish pilgrim en route for Fatima, he had walked Santiago from (we think) his home town of Toledo on one excursion and from Rome to Lourdes on another with (we think) a few more walks in between, all in aid of multiple sclerosis. The walking is pleasant enough untill we hit the 5km long industrial estate outside our destination of Agueda, this is quiet, it being Domingo (sunday) but boring. (Plenty of cheap lunchtime meals on a workday) After 5km of this we enter the suburbs and see an open cafe, we are early we think, time for a swift half, we have barely sat down when the texts roll in. Betsy has found the intended residencial for the night, it is full, so she is dispatched with the son of the house to The Bombeiros to negociate for a bed! As always, nothing is simple - the Presidente has to be summoned from his sunday meeting to approve us and prefers to try and donate us to the local Red Cross. When he finds that they have no space he finally accepts the inevitable and despatches one of his minions to provide a guided tour of his fire station which turns out to include a large dormitory with bunks for 28 people and some excellent hot showers. We await with interest the possible arrival of 25 other peregrinos or maybe some burly bombeiros! The station is modern and equipped with ambulances and big red fire engines along with more sober photos and roll of honour of nine bombeiros dying in the line of duty in a big fire in 1986. The Bombeiros Volontarios is very reminiscent of the RNLI - a very professional voluntary organisation in a physically demanding and high tech situation. We are grateful for the bed, the only other suggestion in the guide is the "bordello" at the end of the bridge! Papa left town yesterday eventually (lots of shots of plane on tarmac) so Portuguese television will have to find alternatives to fill up the airwaves. We however set off from Coimbra three together again. It was not a great night's sleep, the students were out late. It may have been term end or graduation - there were a few gowns and oddly dressed young people celebrating. There again it may have been a normal friday night in Coimbra. But the fireworks at 00:30 were unexpected. We start along the main road from the station down the bank of the river and branch of following an almost completely overgrown canal. It is very flat, Betsy's shin is behaving itself and we spot 2 or 3 probable marsh harriers. The day continues over a few low rises on mostly minor roads until we join the N1 main road to Porto for a few km of unpleasant walking until we are off once more on side roads. Many of the houses we pass have orchids in bloom on patios, Betsy is a bit jealous, all of hers having died after 2-3 years. The countryside has a few small fields with crops but probably less than the past; there are large numbers of large brick wells in the fields; looking in, the water level is only a metre or so down. They may still be in use later in the year. Betsy's shin is starting to hurt again by the time we pass through a bamboo passage on the outskirts of Mealhada. The town seems to think a lot of itself having a new statue to Bacchus and some tile pictures on the side of the road of a man doing something unpleasant to a pig. 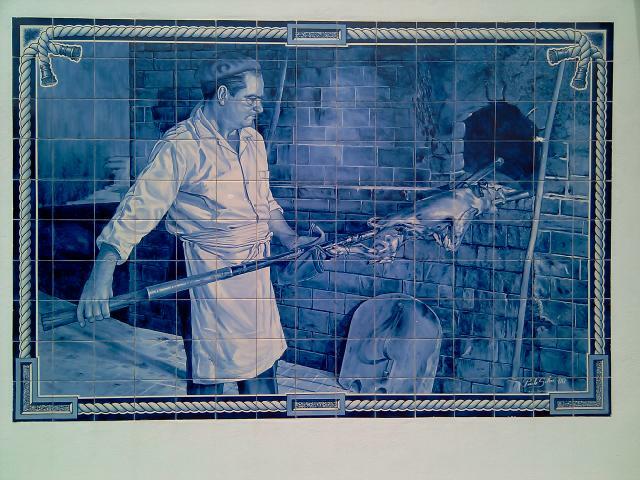 It is famous for roast suckling pig, maybe we will see later if this is justified. Meanwhile we have pizza for lunch before negotiating a night's accommodation at the Residencial Oasis. Another day of rest decreed for Betsy's leg. She will get a bus to Conimbriga to see an extensive Roman site and then bus to Coimbra to meet Tony and Tim. The two set off at first though more limestone scenery with dry river valleys and extensive dry stone walls. One village has bought a job lot of enormous EU brown Camino signs which overwhelm the small discrete yellow arrows we count about six over 2km. Then they stop. After a short while we reach Conimbriga and a nice little cafe with a promo on a pastry with coffee, we are just finishing when Betsy steps off the bus, timing or what? Before we leave the limestone area we come across a small fertile area apparently irrigated by streams arising just up slope flowing briskly in culverts at the side of the lane. An elderly couple are tending their smallholding. She comes and talks to us in rapid portuguese, the word Santiago is the only one we understand and we nod and grunt. She seems to wish us well and wanders off. 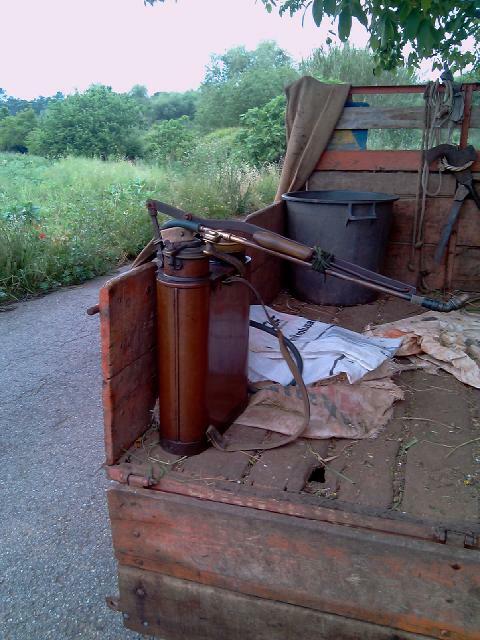 In their trailer pulled by the typical mini tractor of uncertain age is an agricultural antique, a brass crop sprayer probably older than its owners. We press on and the villages become slowly more affluent with more road works. This and a distinct lack of signs send us somewhat off piste. The GPS and maps in the phones show us where we are and where we need to be. An interesting 45mins ensues of pine forest and undergrowth before we find a track with a yellow arrow just before the village we are aiming for. We are now in the suburbs of Coimbra, this is a large city and was the capital of portugal in the 12th century after the crusades "liberated" it from the Moorish rule it had previously been subject to. 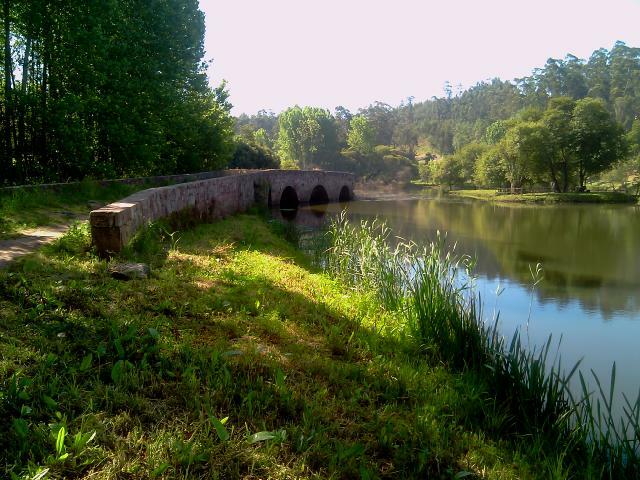 We reach the bridge over the Mondego about 1400 and dive into a bar for a snack and beer and await a text from Betsy. They come thick and fast and we soon meet up. We are looking for a room for the night and are close to the one in our guide when we are accosted by a friendly portugese who asks if we are bound for Santiago and if he can help us, this is not unusual in cities on The Way. We explain we are looking for a room and show him the name, he sets off with us in tow, his English is very good and his wish to help obvious, he has ridden a bicycle to Santiago from Coimbra (his home), he is a bus driver, how do we like portugal?/portugese? All this talk confuses his sense of direction and he stops to ask directions of friends in a shop. He proudly brings us to the door of the pension we thank him, a lovely friendly fellow past pilgrim.:.... We are less than 100m from where he met us! Coimbra is good place to have a wander lots of litttle alleys, a church from 13thC dedicated to our Jimmy and lots of good eating places at pilgrim prices. We find one! The princely sum of €1.5 each allowed us to view the many roman finds in the local museum before a guided tour of the Villa Vicosa de Rabacal from which the objects had been excavated. The villa was a km down the road and the bargain price even included transport for Betsy with the guide. The villa dated from the 4th century AD and was an unusual octagonal shape. It had many beautiful mosaic floors - our guide swept the protective covering of sand off two of them to let us see. 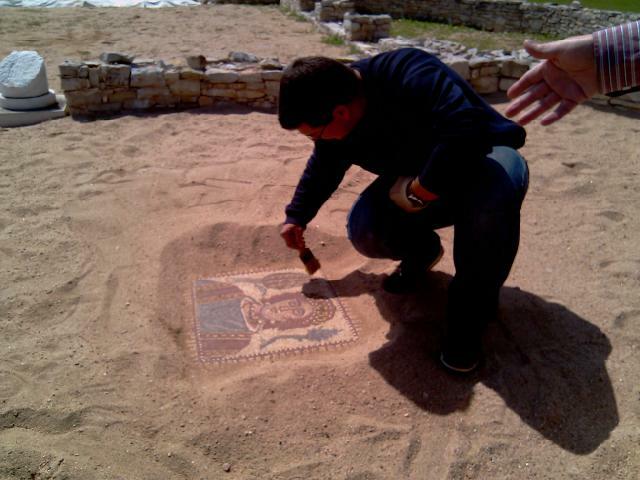 If enough funds are ever found a permanent shelter will be built so that all the mosaics can be left uncovered. The little we could see on site together with carved marble friezes and lattices in the museum made us all agree that it must have been a beautiful house - its location in fertile farmland with good views of the surrounding countryside made a 1600 year old dream home. Then there were two and they set off along very similar paths to yesterday. Olives and cork oaks, some harvested 3-4 years ago. They put dates on them and the trunk forms a smooth black scab and the typical rough cork bulges through in time producing a new skin ready to stuff into more bottles of wine. Seems much more right than plastic closures. Especially since the vines are so close at hand. That there is water close underground is obvious from the many irrigation devices attached to wells some of which we can see water only a few metres down. Most are now unused as are some houses and land in this beautiful area. 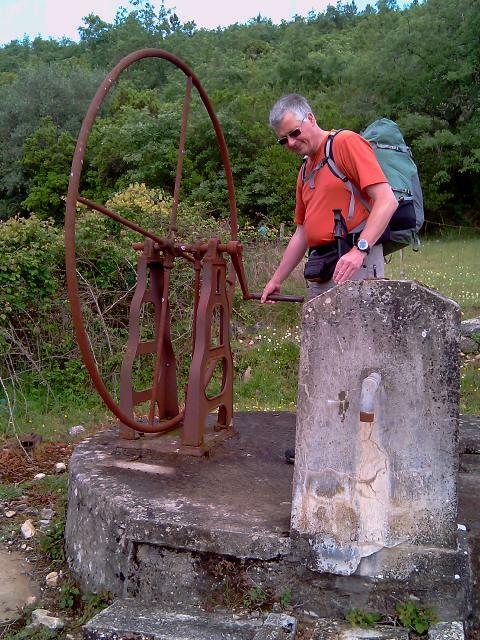 We find a pump with a 2m high wheel attached but despite our best endeavors we cannot coax any water out. Eventually after passing though a lot of limestone walled paths with the now familiar orchids, wild roses and multiple other wild flowers we start to approach Rabacal and meet two other pilgrims on bicycles, one is English the other Polish, she is collecting and pressing wild flowers. We find a bar opposite the church in Raba? ?al and send a text to Betsy, who replies she is in the museum waiting for the lady with the keys to the rooms for the night. After 5mins another text arrives "I can see your rucksacks" she waves through a window of the museum next to the church. Team successfully reunited, and tales of the morning exchanged. Betsy failed to get internet access - after 2 attempts to visit the library a helpful passer-by explained that today was a village holiday in honour of Papa's visit to fatima so the publicised opening times did not apply. OK, next challenge finding a taxi, assuming that one would turn up eventually at the taxi rank in the square. Wrong again! After half an hour faced up to requesting advice from 3 elderly gentlemen sitting on one of the benches. After a long conversation in french one took pity and phoned his taxi driving friend (who was of course at home, also enjoying a day off for papa). Alfredo appeared in 5 mins and provided a slightly hair-raising trip to Rabacal, regaling his passenger with tales of his time in Paris. The final fun was when after arrival and payment he tried to drive off with a rucksack still in the car boot!